My granddaughter was having a 3rd birthday party on the 3rd of November but also on that day was her friend’s birthday. We didn’t want to leave her out on her birthday so I decided to make a present cake for her. I made a 5″ cake filled with jam and butter cream and then covered the whole cake with butter cream and placed in the freezer for 10 min. I then covered in white roll out icing and then colored some icing in lilac, enough for the bow and ribbon and tails. I rolled out the icing and with an impression mat I made the pattern. I then cut two long strips and lay them across the cake cutting off any excess icing. Now I added the tails for the bow. I now added a little bit of Tylo powder to harden the icing so the loops hold their shape. I made two loops and placed these on the cake placing some kitchen paper rolled up inside each loop until they had hardened before removing. I then made the center of the bow and attached this to the cake. 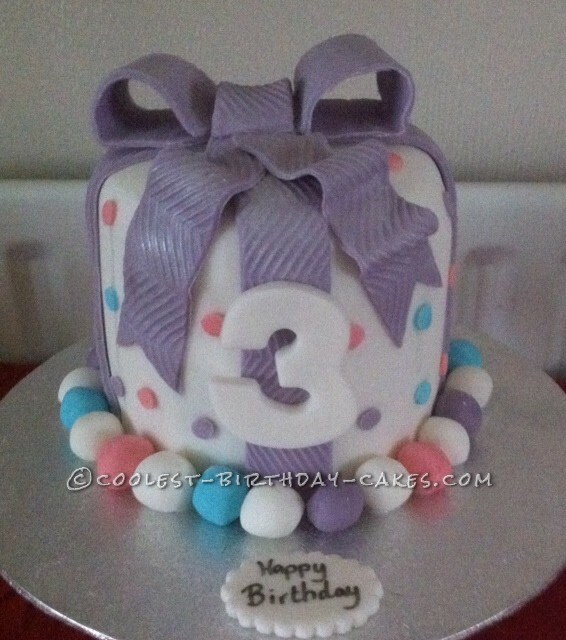 I then cut out small circles using an icing tube in pink lilac and blue I also made some balls of icing for the base of the cake in blue, lilac, pink and white. Finally I made a number 3 and a little plaque to write happy birthday on. We all sung happy birthday, her mom was so pleased that we didn’t miss her out.